I am not a big fan of the style of Yong Tau Foo served in Singapore because the filling is usually very soft. I still consider the Ampang Yong Tau Foo from Restoran Foong Foong, in Kuala Lumpur, Malaysia, as one of the best and I was utterly shocked when one of my friends brought me to an Ampang Yong Tau Foo stall in Singapore and the way it is being served differs so much. I guess it really is “same same but different”!! Hehehe. So, I decided to make this dish on my own as I still prefer the pan fried yong tau foo which is served with a little soup over them. 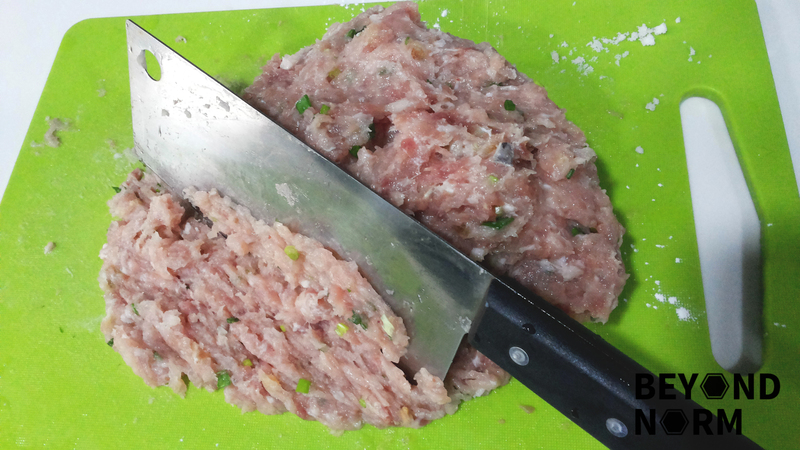 According to my research, Yong Tau Foo is a Hakka Chinese food consisting primarily of tofu that has been filled with either a ground meat mixture or fish paste (surimi). 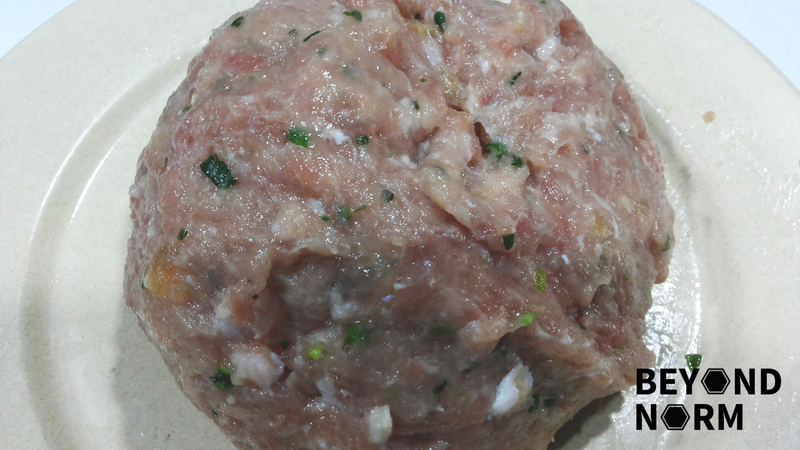 Variations of this food includes vegetables and mushrooms stuff with ground meat or surimi. Yong tau foo is eaten in numerous ways, either dry with a sauce or served as a soup dish. It is commonly found in China, Malaysia, Singapore and Thailand, as well as cities where there are large Teochew and Hokkien populations. My heartfelt thanks to the recipes of Aunty Ruby and Sifu Kenneth Goh which I have referenced in order to come up with my own recipe. 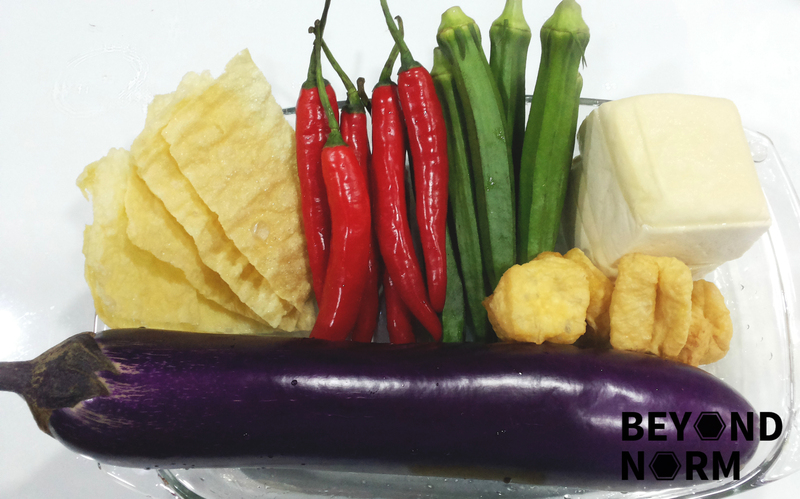 Cut the brinjal/aubergine/eggplant diagonally into 1-inch thick pieces and slit the center to create a pocket. Deseed the chillies and ladies fingers and slit the center. Make a small slit into each of the tofu puffs. Cut the bitter gourd into 1 cm thickness and remove seeds. Using a spoon or a knife, take some filling and stuff into the vegetable cavity. Make sure the fillings are full and firm. Place some paste on half of a prepared beancurd sheet and fold back to seal the filling inside and repeat. As different vegetables have different cooking time, fry the vegetable in stages in accordance to the type of vegetable. 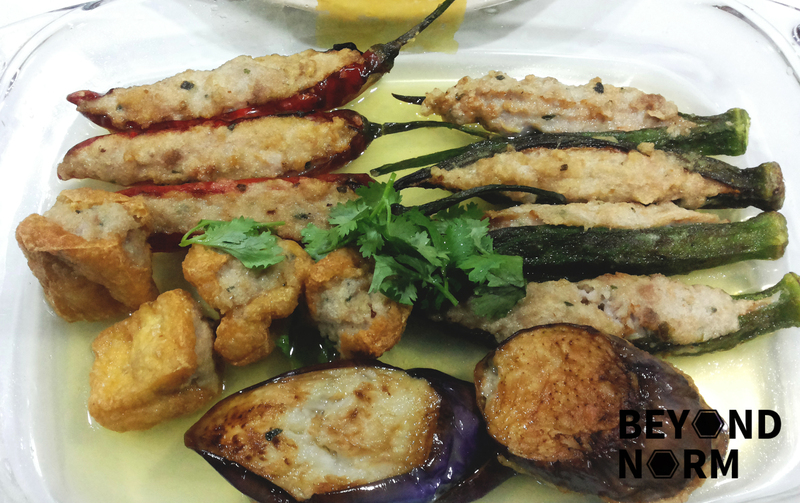 Pan fry (0.5 inch of oil) in medium high heat and fry the brinjal/aubergine/eggplant till the exterior is charred and crisped. About a minute on each side per piece. Drain oil in a colander or using paper/kitchen towels. 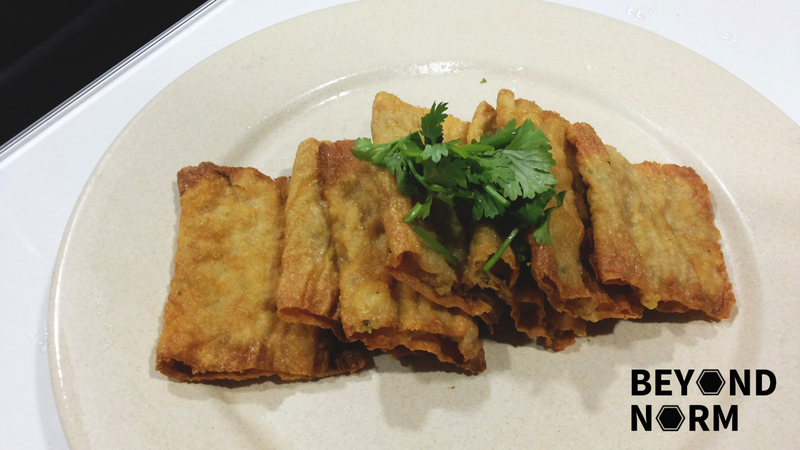 Pan fry bean curd and tofu puff in medium-high heat till crispy. About a minute per side. Drain oil by tilting the piece vertically and place in colander or using paper/kitchen towels. Shallow pan fry the ladies fingers and then chillies thereafter. Take care to ensure that the stuffing is cooked without overcooking the veggies or they will start wrinkling. Drain oil in colander or using paper/kitchen towels. Shallow pan fry the bitter gourd briefly on both sides as this will help the stuffing to stay in the bitter gourd when you cook it in the soup. Take a serving plate and pour some soup (please click here for the preparation of the soup) into it and then place all the cooked yong tau foo in the soup except for the crispy bean curd which should be served separately. Serve with savoury chili sauce and steamed white rice. Heat up a small saucepan on medium heat with 1 tablespoon of oil. 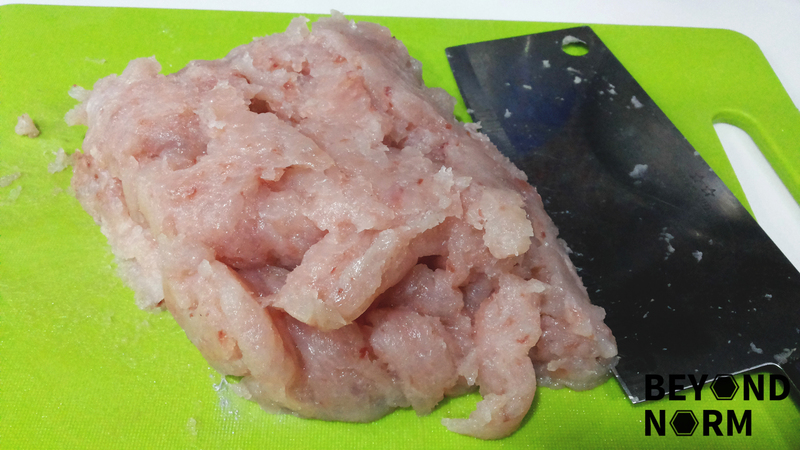 Stir-fry the garlic until fragrant and then add in your bean paste/tau cheong (miso). Do not let it burn. Add in the water, stir well and bring to boil. Then let it simmer. Slowly stir the cornflour mixture into the sauce to thicken it. You may or may not need to use all of the mixture. Pour the sticky bean paste sauce over the yong tau foo on the serving plate. Another good recipe site for people who love cooking! Hi there. We’re glad you like our recipes. 🙂 Thank you for your support!